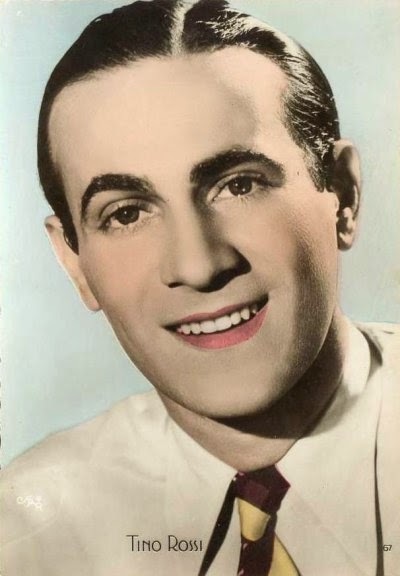 Constantin "Tino" Rossi (29 April 1907 – 26 September 1983) was a French singer and film actor who sold some 200 million records in a 50-year career. His best-known hit was ''Petit Papa No"el,'' which has sold 30 million records. Rossi, born in Ajaccio, Corsica, was gifted with a voice well suited for opera. He became a tenor in the French cabaret-style. Later, he appeared in various movies. During his career he recorded hundreds of songs and he appeared in more than 25 films, the most notable of which was the 1954 production, Si Versailles m'était conté... directed by Sacha Guitry. His romantic ballads had especially women swooning and his art-songs by Jules Massenet (1842–1912), Reynaldo Hahn (1875–1947), and other composers, sold out theatres wherever he performed. As a young man, Rossi played guitar and sang in many places of his hometown of Ajaccio, but later he went to perform in Marseille and at resort clubs along the French Riviera. 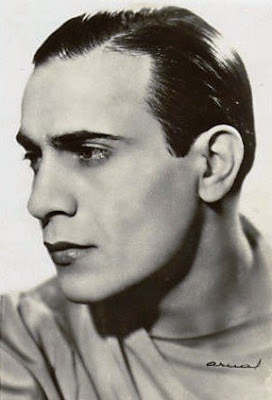 In the early 1930s he went to Paris and within a few years achieved enormous success, joining a Columbia Records roster that included the biggest stars of that time such as Lucienne Boyer, Damia, Pills et Tabet, Mireille, and Jean Sablon. Rossi's success was greatly aided by songwriter Vincent Scotto (1876–1952), who wrote his first hits and collaborated with him for many years, composing and arranging many of Rossi's songs. 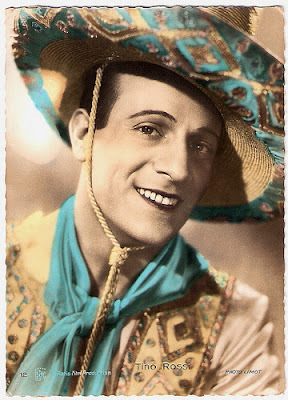 Prior to World War II, Rossi was a major box office attraction in the French speaking world, and expanded his audience to North America and Canada during a first visit there. 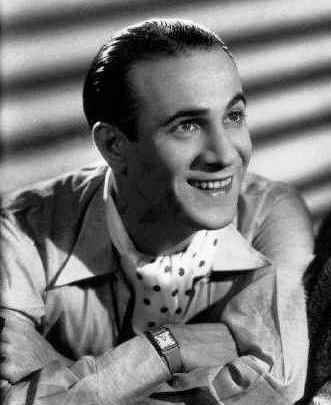 In October 1934 Rossi represented Corsica in La Parade de France, where he was met with much acclaim, but his fame didn't truly commence until he began starring in films (which were accompanied by songs), including Les Nuits Moscovites (1934); and his first real success with Marinella (1936) also Naples au Baiser de Feu (1937). 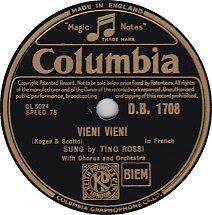 In 1938, Rossi toured the United States after his ''Vieni, Vieni'' stayed at the top of the American record charts for 28 weeks. During the Occupation of France by Nazi Germany Rossi's film career reached its peak, notably with Fièvres (1942), Le Soleil a toujours raison (1943), Mon amour est près de toi (1943) and L'Île d'amour (1944). Like many celebrities, Tino Rossi was arrested on October 7, 1944 by several police officers in search of information on his close Corsican friend, Etienne Leandri, suspected of active collaborationism. Following three months detention in the prison of Fresnes, near Paris, during which he stubbornly refused the assistance of a lawyer, he was freed from further detention by a judge, who deemed the charge levelled against him void of substance. Tino Rossi who, in October 1943, had loaned his personal car to a resistance network to transport weapons and enable several escapes (including that of a general), accepted – an extremely rare action at the time – exceptional official apologies. In 1946 he recorded song Petit Papa Noël for the film “Destins.” About 100,000 copies of the record are still sold each Christmas. The song is the recipient of the prestigious musical award Grand Prix du Disque. 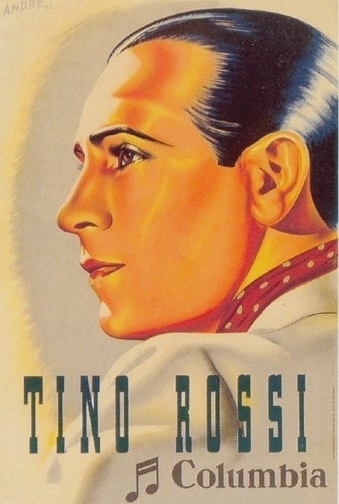 In 1948 Tino Rossi married Lilia Vetti, a young dancer he had met in 1941 thanks to revue leader Mistinguett. They had one son Laurent (1948-2015) and remained married to each other until his death. In 1955 he starred in the operetta Méditerranée, and in the following years he continued performing around France and the world. Tino Rossi's career also evolved into the television era, appearing in a number of popular variety shows. 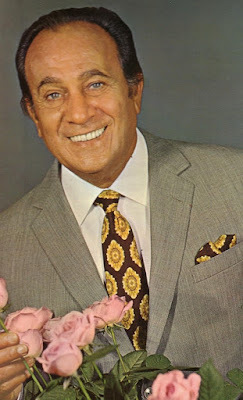 Rossi largely retired from performing by the 1960’s as he passed his 50th birthday and rock-and-roll made his style of music obsolete, but he remained enormously popular with a following built up over 50 years of performing. In 1982, for his contribution to France and its culture, President François Mitterrand named Tino Rossi a Commander of the Legion of Honour. That same year Rossi gave his last public performance at the Casino de Paris, a show that popular demand turned into a three month stint.He died shortly after in his home in the Parisian suburbs on September 26, 1983 of pancreatic cancer.